Leelakumari’s motivation and pragmatism are exemplary, her signal ability being to draw diverse parties into her struggle: villagers, courts, political parties, environmental groups, and doctors. 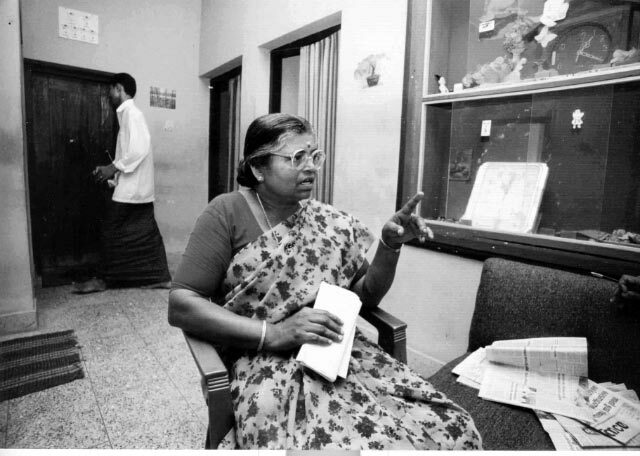 Leelakumari Amma (born 1948) won a one-woman campaign against the pesticide lobby, government departments, and her village’s powerful plantation owners. Upon realizing that the spraying of the pesticide Endosulfan (classified as “highly toxic” by the US Environmental Protection Agency) was endangering her son’s health, she won a court order banning the aerial spraying of pesticides on her village. Her struggle has set off wide-ranging discussions on pesticide impact on health, with countries such as Cambodia banning the use of Endosulfan. After Leelakumari Amma moved to the Pullur-Periya panchayat in 1993, she and her family started developing health problems. She realized that these problems invariably peaked when the state-owned Plantation Corporation of Kerala (PEK) sprayed pesticides on the cashew plantation around her village. After speaking to other villagers, she understood that the problem was extremely widespread: Leelakumari decided to do something, and fast. But finding no support within her village, she resolved to wage a one-woman campaign against the pesticide spraying. Failing to persuade the authorities, she approached the courts, managing to get a stay. The plantation management, however, pressurized and intimidated her, forcing her to withdraw her case: she had, after all, to sustain her son’s treatment, pay litigation costs, and struggle against aggravation from both family and society to pull out. But Leelakumari chose to redouble her efforts, contacting environmental groups and technical analysts. They found that the PEK had been using Endosulfan. Since 1978, the spraying of Endosulfan had resulted in high incidences of cancer, reproductive problems, congenital problems like cerebral palsy, and nervous system disorders. Leelakumari’s steadfastness paid off: the next year, before the start of the spraying season, she received an order from the court banning the aerial spraying of pesticides on her village. Her struggle has set off wide-ranging discussions on the impact of pesticides on health, with other countries, such as Cambodia, banning outright the use of Endosulfan. It is a matter of considerable societal pride that the personal struggle of a mother to protect the health of her children, and of others around her, could lead to such far-reaching changes.